"Did You Know About These Bank Rules"
Most banks have stressed on maintaining a Minimum Account Balance (MAB) to avoid penalties. Bank officials argue that this is essential to allow the bank to have a decent CRR (Cash Reserve Ratio) for the RBI. 2017 has been a busy year for the financial sector. Banks, in particular, have been periodically issuing new rules to keep up with the times. Some of these rules seek to address the changes required for digitization initiatives, while others have been made for revenue purposes. 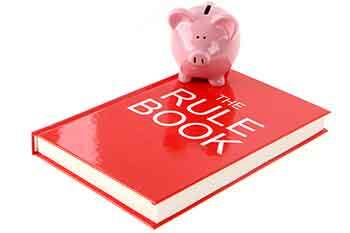 Here’s a quick look at some essential bank rules you cannot afford to miss. Though the basic ‘no-frills’ account still requires no minimum balance, several other types of accounts do. Revisions to the amount required as minimum balance were rolled out by the SBI as well as private banks. The SBI has issued revised rates for the monthly minimum balance to be maintained in their accounts. These range from around Rs3000 in Metro/Urban branches to Rs1000 in Rural branches. The Penalty charges vary from Rs30 - Rs20 plus GST. Senior citizens and minors are exempt from paying these charges. Also, all accounts under Jan-Dhan scheme and basic savings bank deposit (BSBD) are exempt from this. Private players like ICICI Bank, HDFC Bank, and Axis Bank have decided to charge customers Rs150 extra for each cash deposit and withdrawal beyond the four free monthly transactions. For those with BSBD accounts, charges will be applicable for more than 4 withdrawals, but deposits will be free. SBI customers have 3 free cash deposit options. They will have to pay Rs50 per deposit for every extra transaction. SBI allows up to 5 free ATM withdrawals a month. A charge of Rs10 is applicable after that. If you have a minimum Rs25000 in your SBI account, you get unlimited ATM withdrawals. SBI will not charge for UPI/ USSD transactions of up to Rs1000. There are charges for larger amounts. Checking balance and obtaining mini-statements will cost you if you are a private bank customer. For any ‘non-financial’ transactions such as balance inquiry, pin change, and mini-statements a charge of Rs8.5 is applicable. Not only these but duplicate banks statements, PIN generation, and SMS updates have been made chargeable. SBI will charge Rs.15 per quarter for SMS alerts from those accounts having a quarterly balance of Rs25000 or less. Banks have made changes to interbank ATM usage charges as well. Post demonetization ATM charges were temporarily waived off. However, they have been brought back. The SBI allows unlimited free ATM transactions for Salary Accounts and 4 free monthly transactions for non-salary accounts. They generally charge Rs20+GST for Financial transactions and Rs. 10 +GST for non-financial transactions beyond the said limit. Some major Private banks like Axis Bank, ICICI Bank, HDFC Bank allow 3 free monthly transactions. Beyond this, they Charge Rs20+GST for financial transactions and from Rs 8 – 9.5 + GST for non-financial ones. The new rules have met a mixed reception. With banks argue the need to cut costs and promote digitization, several customers have been left underwhelmed by the changes enforced.